I recently had the privilege of attending a couple of geo conferences and thought I'd jot down some thoughts. There's also one I didn't attend...but it's relevant to the discussion and it'll get a few comments too. I've been to a few FOSS events. It's not my wheelhouse, so to speak, given I largely use Esri products due to the nature of my employment BUT, and it's a big BUT, it's crucial that all sectors of geo play a role in supporting the work of those in the FOSS community. We share values. We actually share an awful lot, and attending these sort of events allows exchange of ideas and an opportunity to perhaps foster relationships and contacts across communities. I've long held the belief that the tools you use to do your 'geo' make no difference to how you should be perceived. Proprietary or Free - it's just a different business model to get the tools in your hands. It's what you do with it that counts. 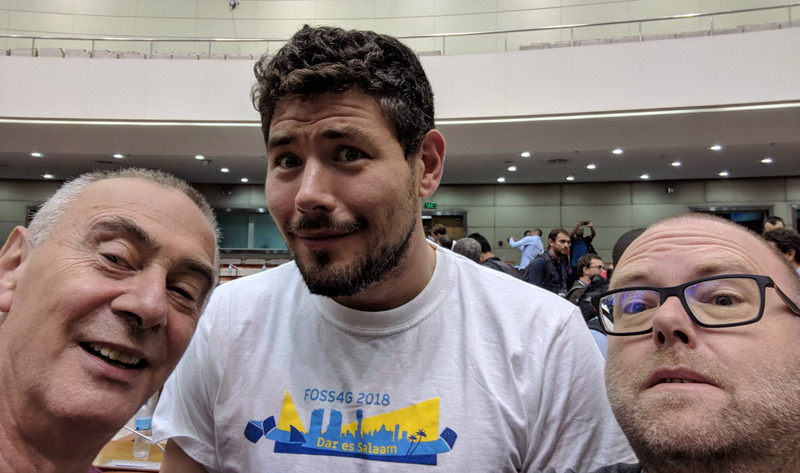 Some of my closest friends in geo are FOSS advocates. We get along fine. Others should too. There was the usual tribal minority who seem to revel in their almost religious hatred of others but I have to say this seems to be a dwindling faction. It was a really valuable few days discussing a multitude of projects and ideas, plotting the spark of a few new ideas and taking the opportunity to reconnect with people I rarely see at other geo events. There was considerable interest in my recently released book Cartography and, also, the MOOC on Cartography that I built along with my colleagues at Esri. Community focused projects, ultimately vendor neutral, that I helped bring to the fore to support the wider community. This was only the second time FOSS4G had been to anywhere in Africa (2008 was in Cape Town). It attracted over 1,000 attendees, including over 150 young professionals and students who were able to take advantage of an innovative travel grant programme that supports them with a financial contribution to help them attend. But what amazed me more than anything was here we were, in a part of the world with many significant barriers to the successful organisation of a large, major, international conference and it appeared to go with out a hitch (I know it didn't, but that delegates were unaware is the success). This is no small feat by the organisers. The web site was populated early, the programme was put together professionally. There was a good mix of work on show, and people from all walks of geo: academic, professional, big business, NGOs, startups and pretty much all the major players such as OSGeo (obviously) but also Esri, Mapbox, Carto, and Google were on board as sponsors. The conference was run professionally. It was dynamic, interesting, vibrant. The social programme was carefully designed to facilitate delegate interaction. There were all manner of meetups. Water, tea, coffee and food was copious and always on tap. There were film crews and a professional team doing the AV. There was professional signage everywhere from booth graphics to directions and room information. The organisers sweated over the small stuff. If you pay attention to the detail you bring together a coherent whole. But here's the thing. It's a serious undertaking trying to organise a conference, any conference, and in this part of the world the challenges are numerous. I was privy to some of the behind-the-scenes issues and to say that some were huge is an understatement. Kudos to the entire LOC for overcoming often very acute problems and delivering a superb event. People left with smiles and I only heard positive comments. 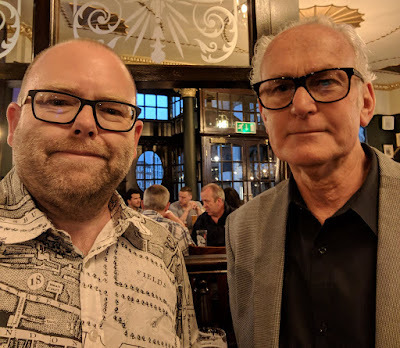 After FOSS4G I hopped to the UK for the inaugural UK Mapping Festival. In past years I've been critical of the model used by the British Cartographic Society whose preference for their conference to be a one day event at a hotel (often in a remote area, often undergoing refurbishment), a single track of presentations (often including product pitches from sponsors), and very little more than an old boys reunion. Now don't get me wrong, the opportunity to reconnect with people you possibly only see once a year at such an event is important (particularly for an ex-pat like me), but it shouldn't be the raison d'être. So I was delighted that the organisers of the annual BCS conference were changing things and going for a week long celebration of UK mapping. Brilliant! Flights and travel booked. Looking forward to it. Unfortunately, after the wonders of FOSS4G I have to say that it was one of the biggest letdowns I've experienced on my 25yrs on the conference circuit. There were signs well ahead of the event. The web site was late being populated with way too much placeholder text and I was hearing murmurings on various backchannels. The booking system was unclear and unwieldy. Speakers and, crucially, keynotes, were being added right up to the event itself. There were supposed to be three main conference days run by various UK geo societies and bodies co-located yet, strangely, with separate registration fees. The Association of Geographic Information went on the 4th, BCS, in conjunction with the Society of Cartographers, on the 5th and the British Association of Remote Sensing Companies (BARSC) on the 6th. OK, so there's no way I'm paying for three separate days so the 5th was it for me. This was a real opportunity missed to support cross-pollination of communities. I'd certainly have been interested in some of the stuff from the other days but not for separate registration fees. I went to the exhibition on the 4th and 6th and numbers were not healthy. This strategy must have hurt attendance. And on the 5th, there were workshops that delegates may very well have gone to but the one-track presentation session was on all day. Why weren't workshops on another day to encourage people to attend for longer? I'm sure there's arguments for all of this by the organisers but it's a baffling approach for delegates shoe-horned into making a choice when there would appear to have been alternatives to avoid that problem. It's not like the conference had parallel tracks so you effectively had to choose between a bit of hands-on training or listening to the talks which, on the whole, were very interesting it must be said. The exhibition was odd - a so-called London street scene which comprised some wooden huts, a London bus and a huge British Army truck. The latter got some interest. The bus got no use at all from what I can make out and the exhibitors...hardly any traffic because it's the same companies that exhibit year on year to the same small group of attendees. I tried to get a coffee on the 4th when I only had an exhibitor pass and was charged £2. If the exhibition was free, where was everyone? Is this an apathetic British population? Is it poor advertising? Is it poor location? Timing? Well, possibly all of these. Holding the conference the week that children went back to school after the summer holidays wasn't smart. Charging a lot for exhibition space didn't help. Locating in London (8 million people) should have yielded a large population of potential visitors but where were they? I've heard a few people say that the accommodation and travel costs to London are too expensive to make it worthwhile but I do wonder whether they are assessing it against the value of the event itself. Make it worth every penny to attend and people WILL attend. I was bemused about the idea of creating a so-called London street scene. I mean, honestly, there was a London street right outside the front door. The conference was actually in London!!! Everyone knows what a London bus looks like! And herein lies the problem - the UK Mapping Festival ended up being a BCS conference in disguise. Same organisation behind the scenes. Same structure. Same exhibition. Same faces. Sure, there were a few variations around the edges but not much. It was stale, unimaginative and, frankly, rather dull. And let me be clear - this is not just me saying this. Many others voiced similar concerns during the day. It cannot continue like this because UK cartographic societies are dying, fast. The Society of Cartographers AGM resulted in a formal winding up process because the Society cannot continue on a shoestring. This is dreadfully sad. SOC has at least tried to move with the pace of change in modern cartography over the last few years where BCS has stood rather still. I sincerely hope some of the smart people involved in the running of SOC are given positions on the BCS Council as SOC members are encouraged to move their membership fees over. The UK Mapping Festival web site was difficult to navigate. Ideas that I know were proposed to the programme committee (and even by those on the programme committee) were either ignored or never followed up. A series of potential high profile cartographic experts as keynotes was replaced by a minor celebrity whose talk was poorly targeted. Ken Hames (who?) was not a motivational speaker. Anything but. Anecdotes from army days and friendships with the late Princess of Wales really aren't what people want from a modern mapping conference. Oh - and it was an additional tenner to attend if you hadn't got a pass for that day. Even the choice of beer at the nearest hotel bar came down to Corona, Budweiser or Becks. And there wasn't even a single complementary beverage. The so-called comedy night was also poorly thought-through as well. Much of the material may have worked in a dimly lit comedy club with a tanked up crowd but only a couple of the acts even bothered weaving in some map-related material. I understand they were cheap to hire. That probably says it all. It's simply not good enough! There is far better out there. People expect far more. Advertised as part of the UK Mapping Festival, the #geomob event on the evening of the 6th was, at least, a little more forward thinking. It was held at the geovation hub. It was free to attend and that garnered nearly as many people as had attended the BCS/SOC conference on the 4th. Event space is given for free. Sponsors help buy beer, nibbles and wine. The atmosphere is one of mutual interest and genuinely, people had a good time and, en masse, decamped to the bar where conversations continued. Organising events is not rocket science and the stuffiness of the days evaporated with the freshness of this particular evening. But why...WHY were only a handful (maybe 3 or 4) people who had attended any of the day's events also at the #geomob event? It's simple. Events that are put on in the UK, unlike the way FOSS4G was organised are targeted to a very very niche group. This is why they fail. There's no real attempt to foster integration. As I said earlier, this attitude has to change. I was also due to present at a Better Mapping seminar on the 4th but it was cancelled with a few days notice due to lack of interest. Only a few people had signed up and the event space (the Royal Geographic Society) needed 12 attendees to make it viable. Now I do not know the finances and the fees structure for the event but it strikes me as astonishing that we cannibalize our own group of core societies by charging for space in this way (if, indeed, that's the case, I only assume it is) and holding it on a day when another competing activity was taking place. The organiser, Chris Wesson, had done a great job putting the event together but it was advertised late, it was a paid-for event (£75 sounds steep to me, though it was free to BCS members) AND put on against a day's event at the main conference site (all sadly out of his control). You can get so much training for free these days that these events have to look at alternative models if they are going to succeed. Cut out venue costs and speaker expenses (they should offer their services and costs for free to contribute...they get exposure for their ideas and companies for a start) and then look at ways to get people interested. This is valuable outreach for BCS and it's another failed opportunity to place some of the UK's prominent cartographic experts at the fore, sharing ideas and espousing the value of a wider community. There were events for children to get involved with at the exhibition. I didn't see a single child involved with any of the mapping activities. I felt sorry for all the hard work that the organiser of that component (Alice Gadney) put in to make a fantastic event space but it was ultimately poorly used. Even the BCS awards dinner descended into minor farce with none of the awards certificates being signed and one award (the Henry Johns award) not even judged by the time of the evening ceremony. This may seem a terribly minor issue and it is, in many ways. But it's not the first time it's happened and it's just symptomatic of the issues that bubbled to the surface once more. And what of the attendees - yes, many of the usual faces but perhaps surprisingly, some very notable absentees who you'd ordinarily see at these events. 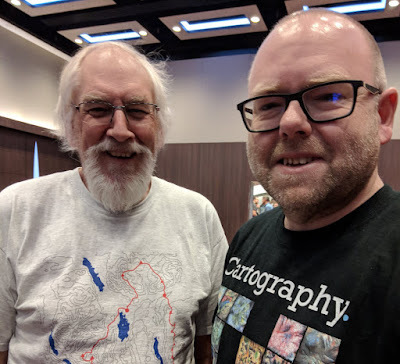 Again, it's unclear why but I'd have thought the Chair of the UK Cartographic Committee, also on the Executive Committee of the International Cartographic Association, might have attended. UKCC represents UK cartography on the international stage. Some sort of report, review, or statement would be useful. 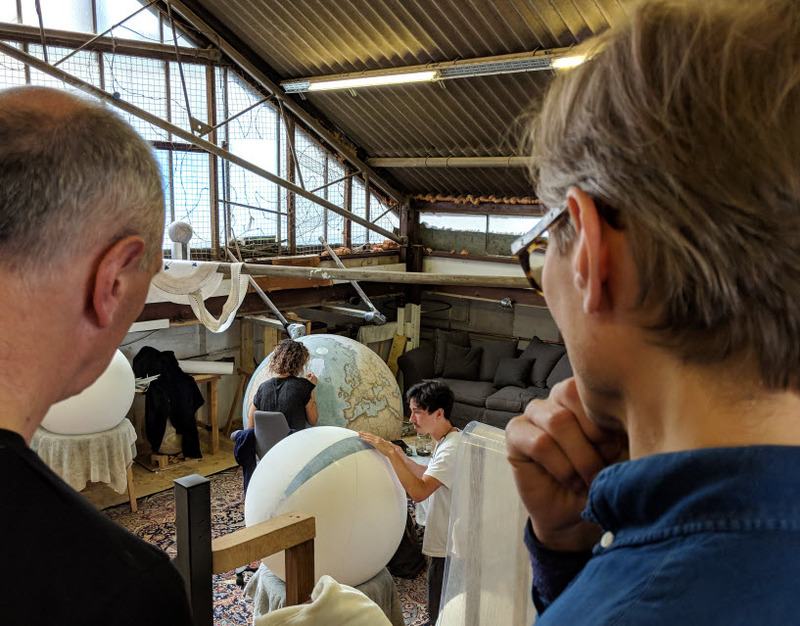 In that person's absence, surely some sort of acknowledgement of how the UK is shaping up for the International Cartographic Conference in Tokyo in 2019 might have been forthcoming? Nope. Anyway, to many of the people I spoke to at the event, it was simply a letdown and the promise of something fresh and different simply did not materialise. Back to the drawing board for next year but I feel there's more than simply a change of city and venue and tinkering with the model that needs to change. I didn't go, but I know someone who did. I had to make a choice earlier in the year whether to go to the UK Mapping Festival or GeoCart. I've been to the last four events (they're every other year rather than annual events). They attract a similarly sized crowd to UK events (around 100 people). I plumped for the UK but regret my decision. By all accounts GeoCart was vibrant and fascinating. With a similar amount of people (from a population of around 4 million - half that of London!!!) they manage to encourage not only attendance but participation. Instead of a single track with 12 presentations there were well advertised pre-con workshops and two tracks offering over 100 presentations. There's ice breakers with free wine. There's a relaxed gala dinner where you don't have to decide your menu choice months in advance. All in all - a similar conference yet the difference with the UK Mapping Festival could not be more profound. And my simple question is this...if a society like the New Zealand Cartographic Society can develop something really rather magnificent, why do we continually fail to do so in the UK? As people who know me appreciate, I make these sort of observations and comments out of a love for the societies that I have grown up belonging to. I hate to see them, and the events they stage, wasting away. While some (like the New Zealand conference and, also, the hugely enjoyable NACIS conference in North America) seem to have moved with the times, adapted, and worked hard to develop a model that works, the UK efforts are sorely flagging. They are tired, generally expensive to attend, and disappointing. There are so many geo events that people are making hard decisions on what to attend and, currently, events staged by the British Cartographic Society, their preferred organsing company and the like are suffering. they're actually making decisions much easier to make! Heck, I even sent an email and get a private visit to Bellerby Globemakers arranged with no effort at all. It can't be that difficult to arrange events that actually interest people, take advantage of a locality and make them WANT to visit. Everyone knows what a London bus looks like so having one parked in an exhibition hall isn't going to be much of a draw. But what an opportunity missed - London. There are so many fascinating map-related places and people in and around the capital and none were harnessed. And I have left the biggest issue of them all until last. The UK Mapping Festival was scheduled for 2-7th September. It still says that on the web site. Some (me, and a few others at least) booked flights and London-based accommodation on that basis. It turns out that there was nothing, absolutely nothing, on the 2nd, 3rd, or 7th at all. I was told that the intent had been for other events to take place but they didn't emerge. Why? And when it became clear that the 6 days was fast shrinking to 3, and just a single day if the other two conference days weren't of particular interest to you, the organisers should probably should have been a little more honest with your potential delegates. I made the best of my time by arranging meetings, visits to places like Bellerby, the Imperial War Museum and the Design Museum to explore their cartographic collections but I wanted to enjoy a week's festival, as advertised...not have to build my own festival. traveled nearly 45,000 miles and stayed 16 hotel nights in London. So what now? Will the BCS conference revert to type? Will anyone actually review what happened and put in place mechanisms for change? Does anyone have the will? I fear there's a long way to go. There's a number of good, young people who have tried to get involved to affect change. My understanding is it's a challenging environment in a volunteer society that has many longstanding officers. But I wonder what their experience is beyond that of their own conference? I don't see them anywhere else so it makes you wonder. They cannot simply live in a bubble forever. Others have to pop it and force change to reinvigorate UK events. I hope for better, I really do. But let's be honest, this is not simply an accusation I'm leveling at the UK and its various geo societies. Many societies and many conferences are stale. They have relied on the same approach for far too long, often underpinned by the same team of people who just rinse and repeat. People aren't stupid and they are getting wiser when deciding where to spend their shrinking conference budgets. I tried my best to help this year by bringing my Lego globe (no-one really commented about it), by making sure we had book giveaways, and by proposing my edible map exhibit...an idea that became too difficult to arrange anywhere in space and time on the 5th that I switched it to the #geomob event where it was devoured. Conferences these days have t-shirts, stickers and badges. I made some of my own as giveaways. Tote bags full of corporate brochures is so 1980 and they only go to landfill. If a small organising committee of volunteers can make a large international conference work in Dar es Salaam, and a similarly sized conference can work with a much smaller population in New Zealand to put on a stimulating event, why can't we get it right in the UK? Hopefully 2019 will see some progress. I live in hope at least. Great insights Kenneth! I hope the organisers take note for AGI, BCS and RGS events in the future. Perhaps it's complacency? We provided the fabric maps for FOSS4G (we'll be at the Australian FOSS4G), just attended the last day at the UK Festival and sponsored Geomob. 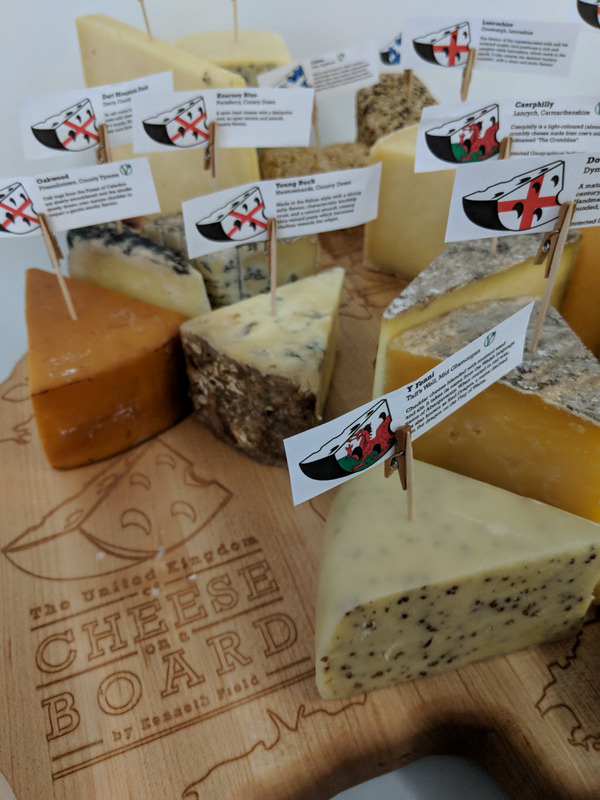 A great chance to meet people we license product from, but I guess, in the UK, we've got used the the status quo, and as a business the registrations and the travel are a big consideration on budget when the events are unlikely to boost sales. I'm quite pleased with the outcomes of SplashMaps' approach this time, not least of all getting to eat lots of cheese to support overconsumption of #GeoBeers!